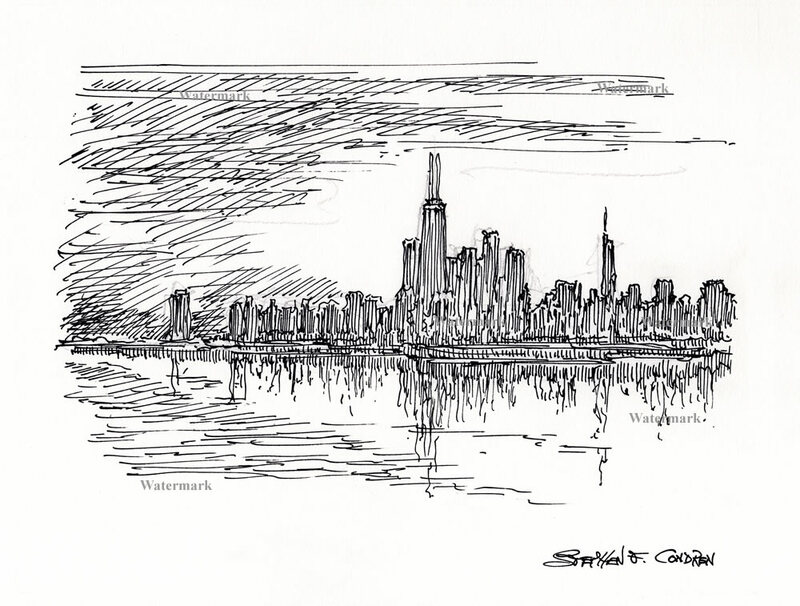 Chicago skyline #751Z pen & ink drawing, which is a cityscape stylus sketch, is for sale at discount with prints by artist Stephen F. Condren, BFA-SAIC, of Condren Galleries, a Fine Arts Gallery, offering JPEG & PDF scans. This pen & ink drawing of Chicago skyline #751Z is a cityscape of the near north side of Chicago at early sunset. In the center of the rendering is 875 N. Michigan Avenue (former John Hancock Center). To the immediate right is a cluster of buildings that comprise the near north side. The exception is the nub immediately to the right of 875, which is the Aon Center. My original intent for the drawing was to make it much darker and with a mood of impending storms. However, while I was drawing I had my mind on the Scientific Theory of Luminiferous Aether. Thus, with light in my mind I let the glory of the sun take command of the drawing. Thus as I moved my pen along the paper it gently came to a halt as the drawing with finished!